This has brewed throughout the decade and is now reaching heights which are quiet frankly – silly. We’re all for hip hop sites and places where we can view and listen to the latest stuff but one has to wonder how far is too far. The last decade has seen hip hop transform itself from more than just music into promotional blogs, videos, articles and websites set up just to promote specific albums. 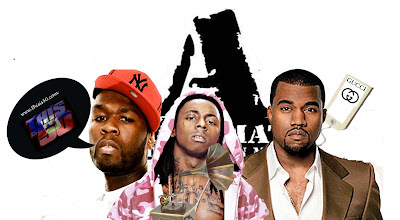 The lateral rise of Twitter, Facebook and MySpace was good news for Stans across the world as they could now synchronise their sleeping, eating and toilet patterns with their favourite rapper. Furthermore the internet is aptly linked to our other topic, Beef. The internet has made beefing so easy and remote that it has transformed from a lyrical war or words, into a matter of online humiliation and finger pointing. 50 Cent has actively used ‘Thisis50.com’ to destroy many of his rivals, and whilst it’s funny as hell, one has gotta ask why they’re not destroying careers lyrically like they used to. Finally, Youtube has been a saving grace, providing us all with a way to upload our own or leaked material (I’m not condoning this…!) oh of course not KNL (editor's note) and has also allowed artist’s epic fails to be readily available to millions – who remembers that dude from Pretty Ricky dancing in his underwear?! Goddamnit – now let us remember that out of these beefs probably 2 or 3 of them actually resulted in hot tracks. The most high profile battles were probably between 50 Cent and Ja Rule, Jay-Z and Nas and Eminem vs Canibus & Benzino. However the rest of this stuff was either a war of words, a war of blank threats and punches and in the case of the last 10 50 Cent beefs – just straight up clowning. I like Fiddy, but this section belongs to him too. Damn just about every Radio friendly song that hit our airwaves required some sort of remix to re-release the buzz and capture everyone’s imagination. Whether it was the frenzy created around Touch It or A Millie – or the crazy re-styles of Usher’s Confessions, everybody seemed to want to jump on the remix bandwagon. However the main prize has to go to Lil Wayne, who made it a personal mission to jump on as many tracks as possible – it got to the point where over the last 2 years it was impossible not to hear him remix something! So it turns out the 90s was the time where Def Jam, Bad Boy, Rocafella and Deathrow to name a few were doing well and providing real music power houses. The last decade however has seen a decline – unfortunately there is probably only one label that lives up to the Music Powerhouse and that’s Dr. Dre’s Aftermath studios, but don’t forget it’s only because they have 3 multi-platinum, now legendary artists. However, remember the days of a video where you saw more famous cats popping Crystal in a club or by the pool than you thought necessary? They’re gone. No more Lox in shiny suits behind Diddy, no more Dogg Pound, Kurupt, Daz etc. lounging in the club behind Snoop…it looks like merchandising is the way to go. Sad times. People rejoice, for now you can wear a pink Ralph Lauren Polo shirt and not be questioned about your sexuality. You can wear the tightest jeans, with the tightest shirt, and a little red bowtie and no one will question your credibility as an artist. Ever since the arrival of our beloved College Graduate and 10,000 Louis bags later, Mr West has introduced classy attire to an undeniable number of artists who now follow his style. Nice list...I think under the remix category we should talk about 9th Wonder's remix of the Black Album and God's son.